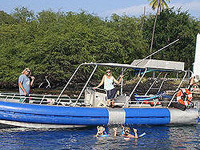 Come experience our Zodiac Raft, Snorkel & Dolphin Adventure off the beautiful Kona Coast on the Big Island of Hawaii. Escape the crowds associated with cruise ship organized excursions and enjoy our more personalized tours. Kona's claim to fame is the beautiful Golden Coast which is renowned for beautiful, calm and clear cobalt blue waters making this an ideal location for a Zodiac Raft adventure. 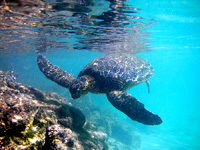 The waters off the Kona Coast are truly blessed with an outstanding abundance of marine life. We have over a half dozen different whale species that live in Kona's waters year round. Additionally, from December to April, the massive Humpback Whales join the local population to make Kona unbelievably magical. Your tour begins with a snorkeling encounter at Kealakekua Bay , a beautiful marine sanctuary and the location of Captain Cooks Monument. Here, you will see exotic species of fish, eels, turtles, and corals. 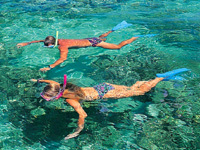 Swim with schools of colorful fish and green sea turtles in the protected waters. Kona is, undoubtedly, one of the best places in Hawaii for snorkeling. 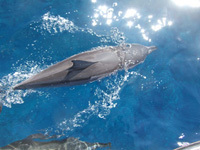 Spinner Dolphins are also present year round off the Kona Coast. They are amongst the most intelligent beings on the planet and observing them in their own habitat will amaze you.